Like the blink of an eye, next week August is rolling to a close and we’ll be facing September! This is such a big year for us. At the beginning of the month, we welcomed Executive Chef David Switzer to our team! 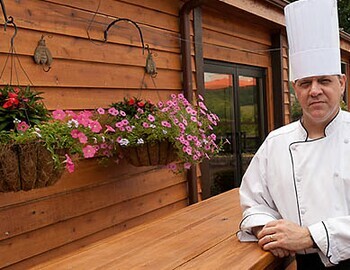 Chef David comes from a diverse background including Stoneleigh Golf and Country Club, Hotel DuPont, Shenandoah Crossings and the Country Club of Virginia. He’s very excited to tackle our opening and bring a new taste to the area! Chef David has been working closely with our Sales Manager, Casey, and General Manager, Bobby, to complete the team. Next in line will be our Food and Beverage Manager we’re hoping to start shortly after the beginning of September. We look forward to continuing to build our Dream Team! Keep in mind we are open to the public and look forward to hosting many in-house and private events in our clubhouse! Coastal Chips which are old bay wontons smothered in cheese topped with jalapenos, lettuce, tomatoes, sour cream and guacamole. Served with blackened chicken or shrimp. Entrees including Cowboy Pork Chop, Pan Smoked Salmon, and a Sirloin Filet in addition to hot and cold sandwiches, pastas, a great kids menu and so much more!! Stay tuned! We hope to share flatware/China/silverware selections in the coming weeks! Below we have a photo of Chef on the range last weekend! Cash sales only but he's offering an American burger and a Cajun style burger.